Visit any health club and you'll see plenty of pedaling. Whether it's spinning classes, stationary bikes, or people getting ready for a group ride, pedaling is a very popular way to stay fit. 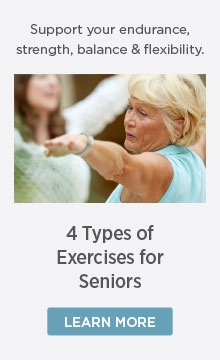 It's a low-impact way to exercise that's especially well-suited for seniors because it's gentle on the joints, easy to do, and enjoyable. “There’s something great about going back to your childhood when you’re on a bike," says Dee, Director of Physical and Occupational Therapy at The Goodman Group. "It brings back the fun and you can move fast.” Besides that fun, she says there are many other reasons to get pedaling — at any age. Maintaining lower body strength is key to avoiding falls and the injuries they can produce. Pedaling — which can be done on a conventional bicycle, stationary bike, or similar types of equipment — strengthens key leg and core muscles while being very gentle on the joints. Studies conducted at Purdue University have shown that people who cycle regularly are 50 percent less likely to be affected by coronary heart disease. Regular cycling can help reduce cholesterol levels in the body and lowers blood pressure, which helps avoid coronary heart disease. Pedaling also strengthens the heart, increasing cardiovascular fitness by 3 to 7 percent. Pedaling reduces those cortisol levels. It can also improve sleep. A study at Stanford University has shown that just 30 minutes of cycling a day can help increase sleep by as much as an hour a night. Now there’s relaxation for you! Pedaling can even improve mental abilities. Researchers from the University of Illinois found that people who cycle regularly also perform 15% better on mental tests. In a group class setting, it can be fun to have a little friendly competition — or even compete for your own personal best. Dee mentioned one resident who every day wanted to go a little farther than the day before. It’s an incentive that keeps many seniors coming back. 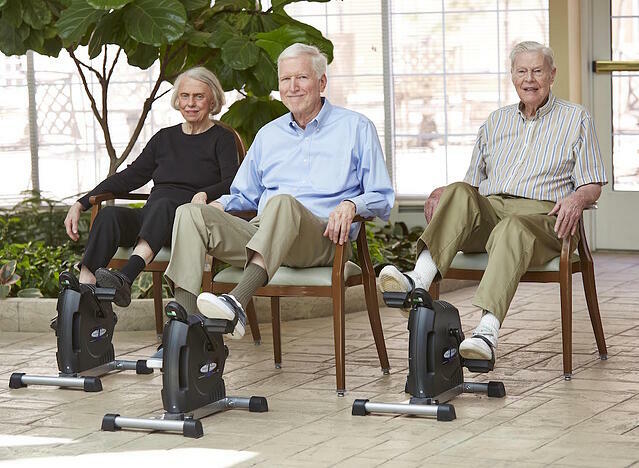 At The Goodman Group senior living residences, pedaling classes are among the most popular. The many benefits of pedaling — strength, balance, relaxation, and social connection — all support the ability to live a meaningful, fulfilling, and independent life, no matter our age. Maybe it’s time to add pedaling to your routine.